Yogyakarta: Thailand's Bluewave Chonburi opened their defence of the AFC Futsal Club Championship title in style, defeating Australia's Vic Vipers 9-2 in a Group C tie on Thursday. 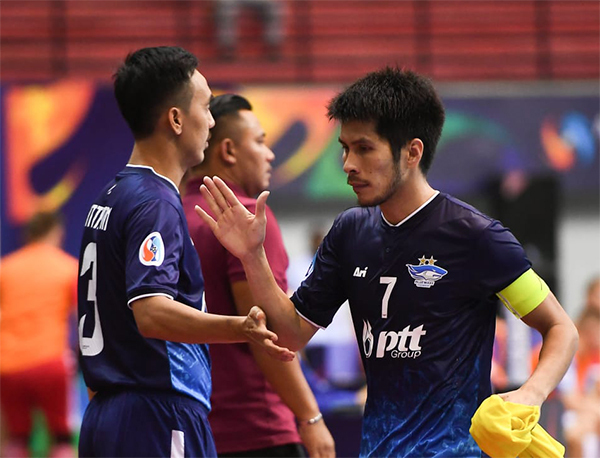 Kritsada Wongkaeo picked up a hat-trick as Bluewave Chonburi sent out a warning to their AFC Futsal Club Championship Indonesia 2018 rivals. Bluewave took the lead in the first minute when Suphawut Thueanklang’s volley from the edge of the area was blocked by Vic Vipers goalkeeper Adam Stuart Cooper but Kritsada Wongkaeo scored from the rebound. Bluewave pushed for their second and came close to doubling their advantage in the sixth minute but Cooper was up to the task as he parried Nattavut Madyalan’s effort. Bluewave had several chances to score again but could not break down Vic Vipers’ defence as Cooper was at his best. The Thai’s persistence finally paid off with a minute left in the half when Jirawat Sornwichian found the advancing Rudimar Venancio who scored from close range. After the break, Vic Vipers pulled one back through Yazid Kamaruzuan a minute into the restart. Two minutes later Bluewave Chonburi captain Wongkaeo made it 3-1 when his long range effort beat Cooper. Venancio increased Bulewave Chonburi's lead in the 23rd minute, picking up his second after some neat exchanges as he tapped in his effort past Cooper. Vic Vipers claimed their second in the 25th minute when Victor Brauner fired his effort past Bluewave goalkeeper Katawut Hankampa. Bluewave Chonburi, however, responded furiously as Madyalan (26th), Sorasak Phoonjungreed (27th), Wongkaeo (31st), Sornwichian (35th) and Thueanklang (35th) rained in the goals for an emphatic win. The champions will take on FC Erem while Vic Vipers will play Al Sailiya next, with both ties on Saturday. "It was a difficult first game but I told them to concentrate and do their best and it was a great opportunity for the young players to get some International match experience. To be the best team in the tournament, you can't be making defensive errors and we made two today and we hope to improve on that. I think the strongest teams in the competition are Mes Sungun and Nagoya Oceans and by saying we can win the competition, it will add more pressure on the team and players." "We played the Asian champions and I think for the first 28 minutes we played really well. No disrespect to the other teams but I will be very surprised if Chonburi don't beat the other teams. Sosecond spot is up for grabs and we have just as much a chance as FC Erem and Al Sailiya and we will try our best and I'm sure they will do the same." Yogyakarta: Debutants Mes Sungun Varzaghan from Islamic Republic of Iran opened their AFC Futsal Club Championship Indonesia 2018 Group D campaign with an emphatic 9-2 win over Tajikistan’s FC Sipar on Thursday. In the fifth minute, Mes Sungun’s Mortteza Ezzati applied heavy pressure on FC Sipar’s Zahir Kamyab, forcing him back into his own box which caused a scramble, and amidst the confusion Dilshod Salomov’s attempt to clear the ball crashed into his own goal. Three-time AFC Futsal Player of the Year and Mes Sungun’s most recent recruit Ali Asghar Hassanzadeh then doubled their advantage three minutes later with a simple tap in through a corner set-piece, before Saied Taghizadeh made it 3-0 in the 11th minute with a superb volley from close range. Being three goals down, coach Benyamin Eghbaly opted for the power play immediately after, which forced the Varzaghan-based club into a defensive position for the first time, but Mes Sungun retaliated by doubling the pressure that kept FC Sipar’s fifth attacking member on the bench. Mes Sungun’s set-piece formation was sublime, with each player positioned in the final third to ensure a finishing touch and in the 15th minute, Touhid Lotfi slid the ball in when he was left unmarked in front of the goal. Farhad Fakhim etched his name on the scoreboard a minute before the half-time whistle when he latched onto a loose ball and released a crackling strike near the second penalty spot to give Mes Sungun a comfortable lead going into the break. Hassanzadeh turned provider three minutes into the second half with his perfect through pass that found Ezzati clear in front of the box and made no mistake to hit home. Rustam Hamidov managed to pull one back for FC Sipar in the 30th minute, courtesy of Sobirdzhon Gulyakov’s pass, but Mes Sungun restored their six-goal lead with Hossein Tayebibidgoli scoring his first goal of the night four minutes later. Reaching the final minutes of the match, Mes Sungun began to show more confidence in their moves around the court and found space in FC Sipar’s half to unleash long range shots. In one such instance in the 35th minute, Abolghasem Orouji discharged a strike that forced custodian Shukhrat Bibudov into a save, but Tayebibidgoli was in a perfect spot to secure a seven-goal lead. Hassanzadeh added another assist to his name with a lob over ‘keeper Bibudov which was headed in by Tayebibidgoli in the 38th minute to complete his hat-trick. However, it was FC Sipar who had the final say when they counter-attacked with 40 seconds left on the clock that saw Gulyakov surging down middle and beating Mes Sungun goalkeeper Saeid Momeni to end the match. Mes Sungun take on Uzbekistan’s AGMK FC, while FC Sipar face Bank of Beirut from Lebanon on Saturday. "Usually, in the first game you would have difficulties because nobody knows what will happen but at the same time, we tried our best to use all of our players. We also tried to recognise the opponent's plays. Altogether, I'm satisfied and the next game will be much better. We will be watching the second game and understand them (AGMK FC), analysing them." "For us in fact, it was a good game. We could learn so many things, and of course I wish my colleagues from Iran the best. But at the same time, we will try our best as well. Our next match is against Bank of Beirut from Lebanon and we have done a little study on them but have not analysed them very well. I hope we have enough time to analyse them and could do our best against them." Yogyakarta: Bank of Beirut from Lebanon enjoyed an opening day win in Group D of the AFC Futsal Club Championship Indonesia 2018 after beating Uzbekistan’s AGMK FC 4-1 at the Gor UNY on Thursday. The opening minutes of the match saw frenetic action, as both sides displayed energetic and assertive fronts. However, the pressure was on Dejan Dedovic’s side as they looked to continue their unbeaten streak against an Uzbek club. In a highly intense match, Ahmad Kheir El Dine finally broke the deadlock in the ninth minute with a beautiful right-footed volley to give Beirut the lead, courtesy of Karim Abou Zeid’s corner set-piece lob. Just a minute later, Beirut were given a free-kick near the penalty spot after AGMK goalkeeper Rustam Umarov and Shukhrat Tojiboev scuffled in the box with Mahdi Javid for possession. Exquisite touches between Patrick Vieira Luz and Javid perplexed the AGMK wall, and Javid made no mistake from five metres to double their lead. After conceding two goals in a span of two minutes, Aleksandr Petrov’s charges upped their tempo, taking the game to Beirut as they looked to capitalise on mistakes but the Lebanese club showed class in their defence to take their lead into the break. AGMK returned from the break more spirited but despite their best efforts, Beirut showed their prowess through set-pieces once again with Javid scoring his second after controlling the ball with his chest and delivering an unstoppable volley in the 23rd minute. Tojiboev ensured AGMK found a goal of their own when he dribbled past two Beirut players before finding the back of the net in the 27th minute. At the half-hour mark, Jovlon Anorov came on the pitch as AGMK’s power player looking to reduce their deficit but the plan almost backfired when he lost possession to Ali Tneich, who then fired a long shot towards an empty goalmouth only to be cleared by Konstantin Sviridov. AGMK’s five-man attacking force diminished Beirut’s field of play, but the two-time quarter-finalists were more than prepared against such tactics and recovered their three-goal lead with Javid completing his hat-trick in the final minute of the game to secure a convincing win. Beirut will face Tajikistan’s FC Sipar next, while AGMK take on Islamic Republic of Iran powerhouse Mes Sungun Varzaghan on Saturday. "It was actually a really tough game. Both sides had many chances, but tactically they won the game. Hopefully we will be ready for the next game. We are going to try something for the next game, because we still have two more games ahead of us." "It's important that we won our first game, that's the most important thing. I'm satisfied with the result, as it as to our favour but we have to play much better and we will play much better in the next game. For the next game, I will give more chances to players who didn't get to play much today. I wouldn't say our next game is easier, but it won't be as tough as today." Yogyakarta: Kyrgyz Republic’s FC Erem fought back from a goal down to overcome Al Sailiya of Qatar 4-1 in an AFC Futsal Club Championship Indonesia 2018 Group C tie on Thursday. It was a hotly contested affair from the start as both teams fought for possession with FC Erem taking the lion’s share. Although Al Sailiya were often pegged in their own half, the Qataris were comfortable defending as they soaked up the pressure, counter-attacking when they had a chance. Al Sailiya, however, took the lead in the 12th minute when Mohammad Safari surged down the right and fired straight at FC Erem goalkeeper Kirill Ermolov. Ermolov, however, failed to hold the shot and Mohamed Ali poked in the rebound from close range to give Al Sailiya the early advantage. Rattled after conceding a goal, FC Erem immediately applied pressure to force their way back into the game and came close to equalising in the 14th minute when Emil Kanetov’s effort was cleared off the line by Murilo Zabot Silva. Hadi Jaber M H Al-Braidi almost doubled the scoreline two minutes later but the forward mistimed Silva’s delivery from the right. FC Erem kept pressing for a goal in the second half and were rewarded in the 24th minute when Kanetov’s long range effort took a deflection to equal the tie. Al Sailiya cracked under pressure as they conceded again in the 25th minute when Iuldashbai Salimbaev lost his marker with a clever turn at the top of the penalty box to blast his effort past goalkeeper Ahmad Khalil for his team to take the lead. FC Erem then scored two quickfire goals in the 26th minute courtesy of the Akbar Kazemi and Pavel Taku combination. Kazemi connected beautifully from close range following Taku’s lob from the right which he squeezed through the legs of Khalil for a 3-1 lead. Taku then got on the scoresheet next when FC Erem increased the intensity of their attacks as Kazemi was left unmarked in the middle as he fed Pavel for a simple tap in. FC Erem will face defending champions Bluewave Chonburi while Al Sailiya will meet Vic Vipers of Australia on Saturday. Yogyakarta: Kritsada Wongkaeo praised his teammates after his hat-trick helped Bluewave Chonburi to a 9-2 win over Vic Vipers in their Group C tie at the AFC Futsal Club Championship Indonesia 2018 on Thursday. “My teammates played a huge part in assisting me to get a hat-trick. It was all teamwork. I could see everyone was focused and they gave their all in the game. “This was our first match and it was against Vic Vipers, hence our strategy was to sit back and gauge the opponents,” said Bluewave captain Wongkaeo. The defending champions can make tournament history by becoming the first team to win back-to-back titles and claim their third championship. The feat will also equal Japan’s Nagoya Oceans who won titles in 2011, 2014 and 2016. Rakphol Sainetngamwas’ team play their next match on Saturday against debutants Al Sailiya, who lost 4-1 to FC Erem in their opener.